Dean Baquet calls out Trump; Puma pulls Nike-dissing tweet; Johnson & Johnson annual report admits subpoenas; USA Today editor caught in USA Today investigation; Instagram lands Roger Stone in court. 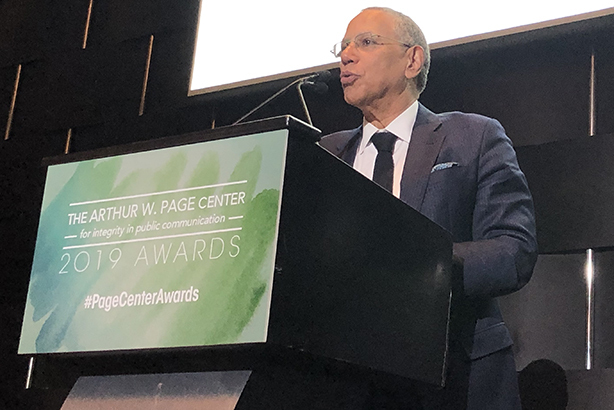 New York Times executive editor Dean Baquet threw out his original speech for the Arthur W. Page Center Larry Foster Awards dinner Wednesday night to respond to President Donald Trump’s tweet calling the Times "a true enemy of the people." In his revised remarks, Baquet noted that the phrase had been "so embraced by dictators and despots" that even Soviet Premier Nikita Khrushchev had discarded it. "No president has ever uttered those words in public," Baquet said. Baquet was one of three honorees at the awards dinner held at Grand Hyatt - Midtown Manhattan Hotel in New York. The center also posthumously honored AT&T’s Marilyn Laurie, the highest-ranking woman in AT&T history, and Dr. Jack Rowe, former chair of Aetna. Well that was fast. In an ESPN broadcast basketball game between Duke and North Carolina Wednesday night, Duke freshman Zion Williamson had one of his Nike shoes fall apart mid game. On Twitter people joked about how nervous Nike execs must be after the public failure. Then Nike competitor Puma chimed in from its basketball Twitter account tweeting: "Wouldn't have happened in the pumas." Reading those annual reports closely. Reuters reports that Johnson & Johnson, in its annual report Wednesday, acknowledged it has been subpoenaed by the U.S. Justice Department and the Securities and Exchange Commission over litigation concerning alleged asbestos contamination. According to Reuters, it’s the first public disclosure of the subpoenas. In December, a Reuters investigative story alleged that Johnson & Johnson had known small amounts of asbestos were sometimes found in its talc and powder products but did not tell regulators or the public. In a case of ‘gramming gone bad, Roger Stone will face a judge today over a recent post he made showing Judge Amy Berman Jackson with gun crosshairs behind her. Stone has since deleted the post and his legal team sent the judge in a "notice of apology."